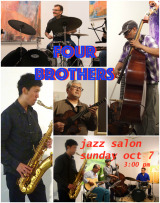 This afternoon, October 7th, at 3:00 Gallery RIVAA opens its doors at 527 Main Street to the first Jazz Salon of the fall season, featuring Four Brothers. Saturday, October 6th, Roosevelt Island celebrates its annual autumn celebration of creativity, Fall for Arts, from 11:00 a.m. until 5:00 p.m. Sponsored by RIOC, Four Freedoms Park Conservancy and the Roosevelt Island Residents Associations, activities spread out from the Rivercross lawn south to the tip of Four Freedoms Park. 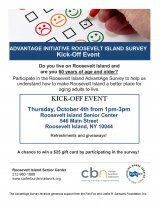 On Thursday, October 4th, the Carter Burden Network, managers of the Roosevelt Island Senior Center, in partnership with the Visiting Nurse Service of New York with generous support from The Fan Fox and Leslie R. Samuels Foundation, launches an initiative to survey residents over 60 on Roosevelt Island about how to best meet their needs. In February, Four Freedoms Park Conservancy invited photographers to submit competitive photos that creatively feature the Park's themes —freedom of speech & expression, freedom of worship, freedom from want, and freedom from fear. 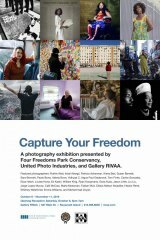 You're invited to come see the compelling results in an exhibit at Gallery RIVAA, 527 Main Street, opening with a free public reception on October 6th. The risk of falls and associated injuries increases with age. Learn what you can do to protect yourself on Wednesday at the CBN/RI Senior Center, 546 Main Street, Roosevelt Island. 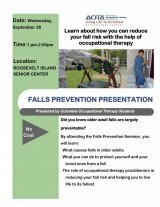 Program presented by Columbia Occupational Therapy Students begins at 1:00. Tuesday evening, September 25th, Cornell Tech launches a new series of conversations with its faculty, an initiative toward community integration. You're invited to attend, free, in the Bloomberg Center at 6:30. 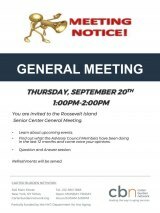 The Carter Burden Network invites all to a general meeting at the Roosevelt Island Senior Center, tomorrow, September 20th, from 1:00 to 2:00. Bringing your questions and get them answered. 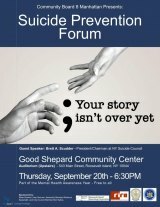 Roosevelt Island Manhattan Community Board 8 representative and RIRA Common Council Vice President Lynne Shinozaki announces that support for Mental Health Awareness Year will feature a Suicide Prevention Forum at 6:30 p.m. on Thursday, September 20th, in the Howe Theatre at the Cultural Center, 548 Main Street. 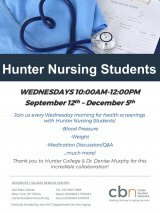 On Wednesday, September 12th, Hunter College's nursing students return to the CBN/RI Senior Center, 546 Main Street, offering free blood pressure readings, medication discussions and more. The visits continue weekly, from 10:00 a.m. until noon.